People have been confused as to how I can draw a picture of myself and have asked whether I have used photographs. This is odd, because nobody is confused when I turn out pictures of fairies and demons. People, it’s very simple: there are no photos and I make it all up 🙂 It did happen like this, but this is only how I think it might have looked. The shoes were in the tow-float, by the way – the orange thing that was slightly irritatingly bouncing on my bottom for a lot of the swim, but is actually an awesome object for being visible, and for carrying stuff. The very nice Chillswim people make them. 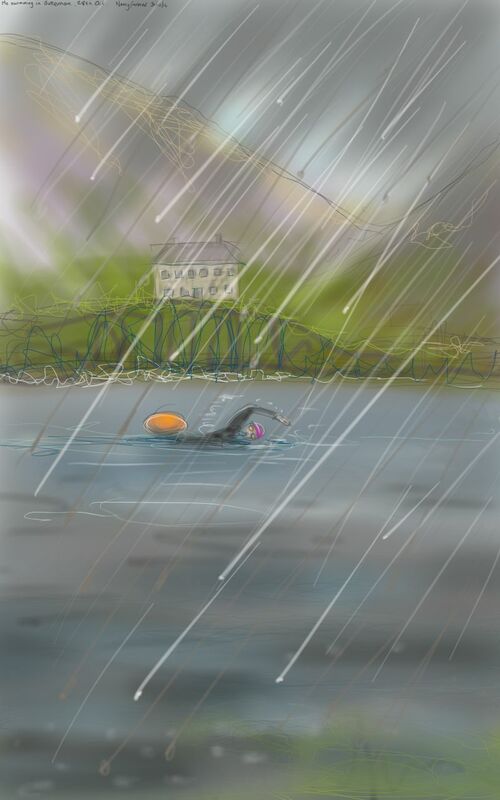 This entry was posted in Events, People, Places, swimming and tagged art, Buttermere, chillswim tow float, Cumbria, digital sketch, drawing, Lake District, me, self-portrait, tow float, wild swimming on October 31, 2014 by Nancy Farmer.